When it comes to cloud storage, Dropbox is the name that immediately comes to mind. Do you really think that Dropbox is the best cloud storage service out there? Meet pCloud, one of the Dropbox competitors. The name of pCloud might not as popular as other Dropbox competitors such as Google Drive and OneDrive, but speaking of features, you can’t underestimate it. 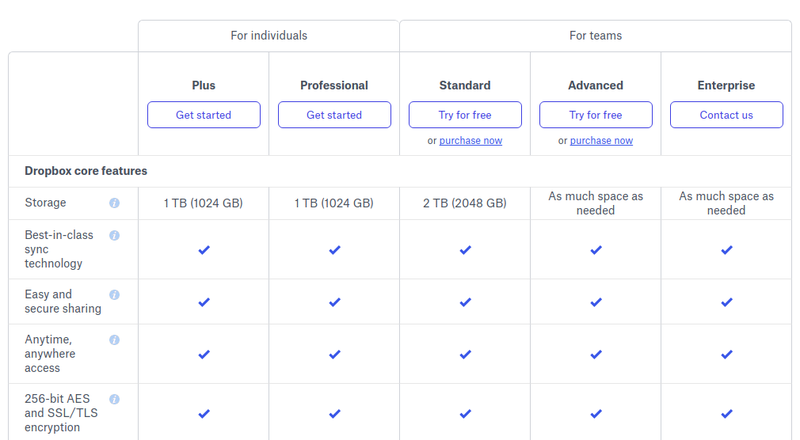 pCloud even offers more spacious free storage capacity than Dropbox and OneDrive do. Regardless the popularity of the two, let’s find out which is the better between them. Free storage capacity remains the aspect people consider the most when choosing a cloud storage service. Especially those who want to use a cloud storage service for personal use instead of business. Dropbox is the cloud storage service that offers fewest free storage capacity compared to similar services. Currently, new Dropbox users will only get as big as 2 GB of free storage capacity. If free storage capacity really matter to you then there is no reason to not choosing pCloud instead of Dropbox. pCloud gives new users a 10 GB of free storage capacity and you are free to store any type of file. Just be wise if you want to share your files on pCloud since you have a monthly download link traffic per month. The amount is 50 GB. Regardless the operating system they use, all internet users are able to use cloud storage services like Dropbox, Google Drive, OneDrive and pCloud thanks to the web technology. However, the use of a cloud storage would be more optimal if you install a client app on the operating system you use. The client app of a cloud storage plays a role to sync your files. For instance, if you want to sync your Dropbox files with a selected folder on your Mac, you can install a Dropbox client for Mac. As the title of this article suggests, pCloud and Dropbox are two best cross-platform cloud storages. The two provides client app for major platforms be it desktop or mobile. Both pCloud and Dropbox provide client app for Windows, macOS, Linux, iOS and Android. In cloud storage, file manager is the web application you can use to manage your files and folders. Commonly, the features and capabilities offered by file manager of a cloud storage service are not much different to desktop-based file manager like Windows Explorer and Mac’s Finder. You will be able to rename a file or folder, deleting, move a file to a folder, make a copy and so on. Dropbox, as you knew, comes with a Finder-like file manager. You will see a bunch of turquoise folders on the file manager of your Dropbox account. There are two view modes you can choose, list and grid. You can also sort the files by name, size, date modified, type and extension to ease your job in finding the files you need. A search box lies at the upper of the file manager makes it easier to find certain files or folders. 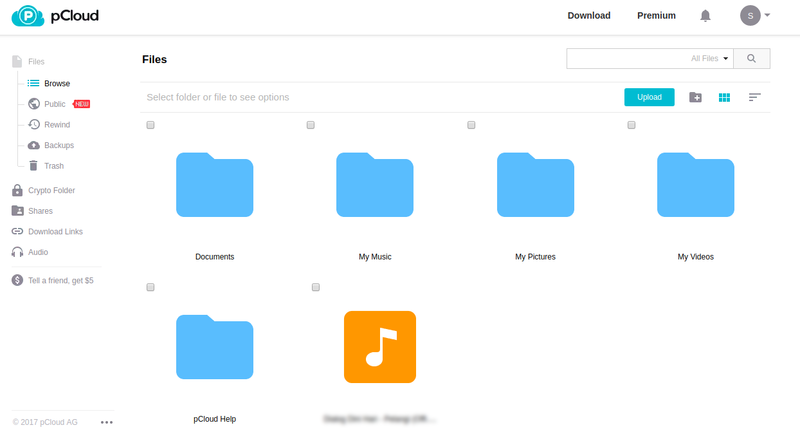 On the right panel, you can see menus to create a new folder and to upload new files. pCloud also comes with a turquoise icon folder, reminds us to Mac’s Finder. The pCloud file manager also allows you to change the view mode from list to grid, and vice versa. An Upload button lies above the folder icons with a folder icon lies right next to it. You can use these two buttons to upload new files and create a new folder, respectively. In pCloud, you can only sort your files and folder by name and date modified. There is a search box you can use as well. In pCloud, you can filter the search results by file type. 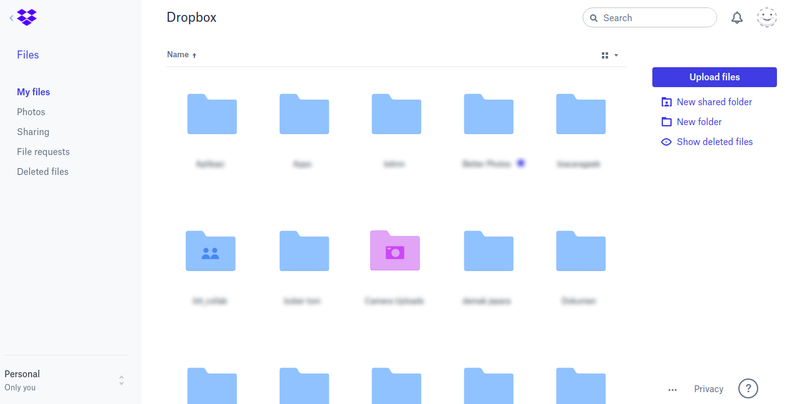 Overall, be it Dropbox and pCloud come with an easy-to-use file manager. Even new users won’t meet any problem to use them. The game has changed. Today, all cloud storage services have transformed from a mere service to store something online to a collaboration tool. Dropbox and pCloud are also kind of cloud storage service with such capability. Be it on Dropbox or pCloud, you can create a folder and share it with your team members. One of the example uses of Dropbox and pCloud as a collaboration tool is you can create shared folder and put all the resources needed by your team on that folder so everyone on your team can access them. When inviting someone to join a folder — be it on Dropbox or pCLoud — you can also set the permission whether you allow them to add new files or just viewing the contents of the folder. The main function of a cloud storage remains to store files. But sometimes, you need to perform certain action over the files you have. What I am talking here is not about deleting, removing, renaming or something like that. But rather what you can do with the files you have. For instance, in Dropbox you can open a DOCX file as well as edit it without leaving Dropbox. The major downside of pCloud is that it doesn’t offer a document editor. The only thing you can do with the document files you have on pCloud is just previewing it without being able to edit it. Dropbox, on the other hand, has integrated its service with Office Online to allow you open as well as edit document files, spreadsheets and presentations. However, there is one thing you can do in pCloud that can’t be done in Dropbox regarding the audio file. pCloud allows you to directly play audio files (including MP3) right from the file manager. You can even create playlists. Freemium is still the common business model adopted by the vast majority of online services, including cloud storage services like Dropbox and pCloud. 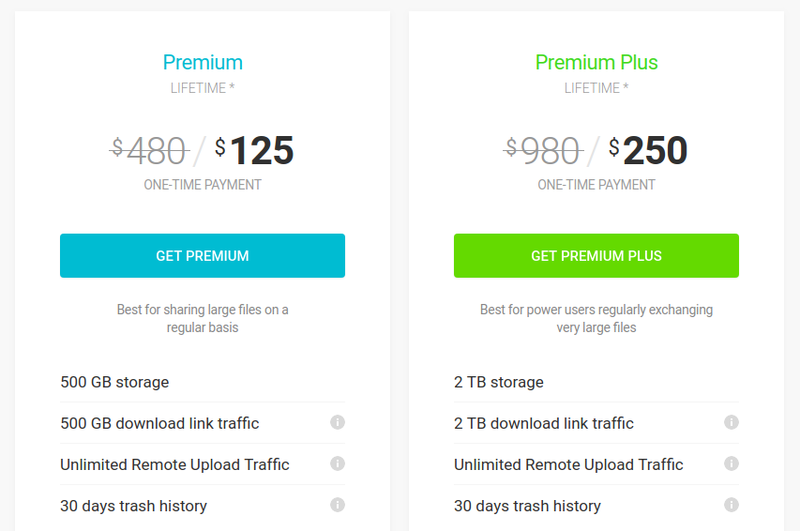 If you already feel comfortable using certain cloud storage service and want to get more space, you can simple subscribe to the premium packages. Dropbox divides its paid packages into two package types. For individuals and teams. Each package type consists of sub-packages. Below is the table of the packages offered by Dropbox. Meanwhile, pCloud offers only two packages: Premium and Premium Plus. See the table below to see the difference between those packages. The interesting thing about pCloud is that it offers lifetime packages. If you choose these packages, you will only need to pay once. Looks more expensive at first, but it’s a good investment for a long run since you don’t need to spend monthly/yearly budget. Both Dropbox and pCloud accept a wide range of payment methods, including PayPal and credit cards. Just be careful when choosing a paid package. In addition to additional storage capacity, each package also offer additional features. Ask yourself if you really need the features. Especially for “For teams” packages of Dropbox, you will be charged per user. There are several other aspects you need to you consider when choosing a cloud storage service. But overall, the points above are most crucial ones. If you just need a cloud storage for a personal use without any aim of upgrading your free account then pCloud is better suited. Conversely, if you need a cloud storage for a teamwork, Dropbox is a better suited option. Other advantage of Dropbox is that it is widely supported by other services. Popular collaboration tools like Slack and Trello come with a good integration with Dropbox, allowing your collaboration be more seamless. 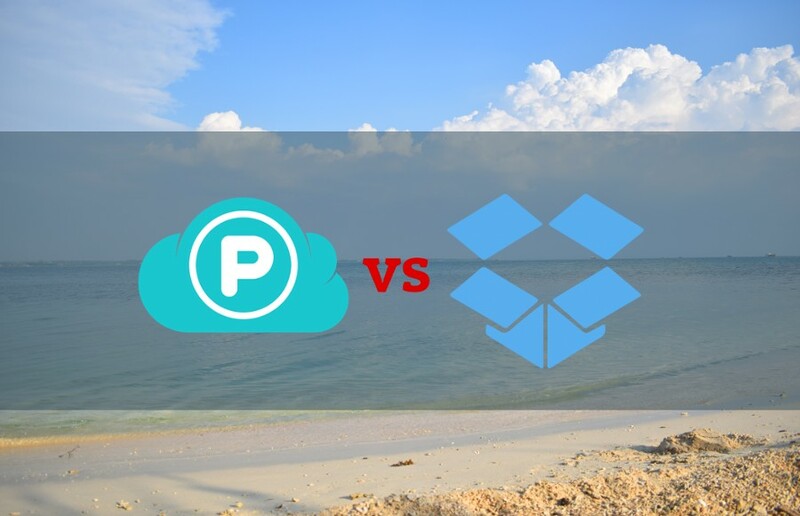 However, the overall features of pCloud and Dropbox are not much different.